Make a splash with these chic Silver Tone Bright Red Faux Pearl Drop Earrings. 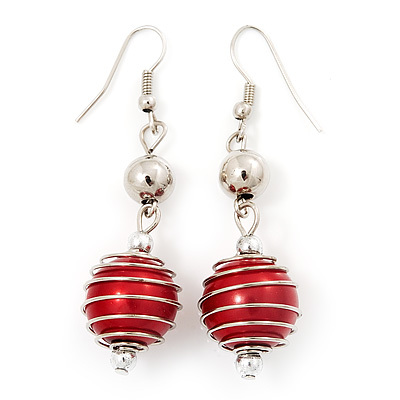 Featuring a single bright red faux pearl (about 15mm in diameter) set in a silver tone cage-shaped construction. The earrings have a total drop of about 5.5cm and secure with a shepherd's hook fastening. These stunning earrings can be twinned with a matching bracelet BR00738 and a necklace N04479 to create a delightful combined set. Each earring weight is about 5g.